The Kitchen Garden is having somewhat of a renaissance at present, with fresh food, food miles and organic produce providing a welcome alternative to food scares, factory farming and climate change. Vegetable seed sales have soared in the past few years, and it’s no surprise that the kitchen herb garden is also making a comeback. Herbs are so easy to grow, yet make a world of difference to the soup, stew or dish that they’re added to. They’re not only fragrant and often aesthetically pleasing, but also provide a plethora of health benefits, such as soothing teas and natural beauty fixes. And what’s more, with the Internet providing a seemingly infinite number of recipes, a kitchen herb garden can add a colourful, fragrant, exciting addition to any garden and kitchen, no matter how large or small. If you’re a keen gardener, have a sunny windowsill, propagator or greenhouse, you may be able to grow your herbs from seed. Herb seeds can cost anything from under £1 to around £2 or £3 for a fair number of seeds. Although growing from seed can cost less than continually buying dried herbs or herbs in pots from the supermarket, remember to factor in the cost of buying potting compost, sharp sand and plant seed trays. Many herbs are native to Mediterranean and warmer climes that we enjoy in the UK – however, that’s not to say that they won’t flourish if planted outdoors. Most herbs will enjoy a sunny aspect and free draining soil, and can – up to a point – tolerate drought-like conditions. Rosemary and lavender are two popular herbs, both with culinary uses, which can be grown in pretty poor soil conditions. So it’s good news for those who have little or not outside space, as many herbs will also happily grow in containers. Simply add an inch or so of crocks or gravel at the bottom of any container, fill with soil and plant your herbs. Remember to leave them some room to spread, especially creeping varieties such as chamomile and lemon thyme. 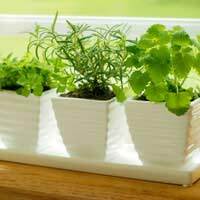 In summer, container-bound herbs in sun will need watering little and regularly, but in winter will need only an occasional soak. If you have a little more space than a balcony or window box, you might consider creating a raised bed in a sunny aspect. Herbs come in all different shapes, sizes, colours and fragrances, and a kitchen herb garden will actually prove an attractive feature. Raised beds will not only make your herb garden an attractive focal point, but should reduce the need to weed and protect your herbs from pests. Just consider that your kitchen herb garden should ideally be situated as close to your kitchen as possible! If you’ve got enough room to make a separate kitchen herb garden, you’ll again need to make sure that the soil is free draining enough. The majority of herbs will not like wet or boggy soils, so clay soils may need some soil conditioner and matter dug in to improve drainage. Consider height and depth in your planting scheme – some herbs such as Angelica will grow up to six foot, whilst others will creep and spread at ground level. Dill (or anise), mint and lemon balm are also prolific growers, so don’t be too conservative in cutting back at the end of your growing year, otherwise you’ll be swamped! Your planting scheme should also take into consideration your tastes – parsley may be fairly easy to grow, but do you use it much, and do you need so much of it? Hyssop has beautiful flowers, but should you investigate what its culinary uses are before you put two or three plants in? If you’re not sure, why not have a flick through your favourite recipe books, experiment a bit and do some research. Never heard of majoram? Not sure what bay leaves actually taste like? Do a taste test - you may be pleasantly surprised! Remember that there might be a great deal of different herbs, but there can also many different varieties of each herb. For instance, there is usually only one type of coriander or basil sold at the supermarket, but a bit of research will reveal that there are over 20 popular varieties of basil alone, each offering their own unique flavour. Mint is another great example, from common mint, peppermint, spearmint and even pineapple readily available to plant. The choice is vast; it’s just a case of allocating space and choosing according to your culinary needs.